What are residual connections? Why residual connections between layers? Ideally, I am looking for a simple and intuitive explanation first, possibly accompanied by schematic representations. The details can, of course, be found in the original papers, but I thought this question(s) would be beneficial to the community. Residual connections are the same thing as 'skip connections'. They are used to allow gradients to flow through a network directly, without passing through non-linear activation functions. Non-linear activation functions, by nature of being non-linear, cause the gradients to explode or vanish (depending on the weights). Skip connections form conceptually a 'bus' which flows right the way through the network, and in reverse, the gradients can flow backwards along it too. 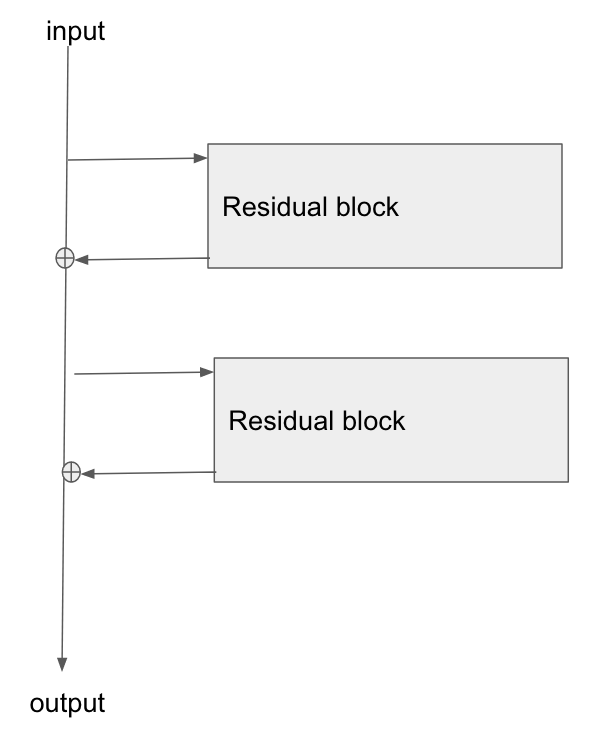 Each 'block' of network layers, such as conv layers, poolings, etc, taps the values at a point along the bus, and then adds/subtracts values onto the bus. This means that the blocks do affect the gradients, and conversely, affect the forward output values too. However, there is a direct connection through the network. I understood the main concept, but how are these residual connections usually implemented? They remind me of how an LSTM unit works. Now, replace one of those blocks with a direct connection. An identity block if you like, or no block at all. That's a residual/skip connection. In practice, the remaining conv unit would probably be two units in series, with an activation layer in between. Not the answer you're looking for? Browse other questions tagged neural-networks lstm rnn residual-networks machine-translation or ask your own question. RNNs: When to apply BPTT and/or update weights? Do RNNs adjust memory during prediction/forward pass? What are the correct training batches, given a sequence length of RNNs? Why this Way of iteration in RNNs? How to initialize weights in the presence of skip connections?